Though most people think only diamonds are graded, there is also a set of criteria to evaluate colored gems. We summarized these in a grading report. Read also about the right lens and the right light. There are three primary colors (red, blue, yellow) and three secondary colors, which are the result of mixing primary colors (purple, orange, green). Nature often displays tertiary colors, such as red-orange, yellow-green, or blue-violet, which are a primary color mixed with a secondary color. When a color is mixed with gray, white, or black, we need the (overlapping) definitions of saturation, hue and tints. Saturation expresses the attribute of perception of gray of the same lightness. All grays have zero saturation. Theoretically a 100% saturation means there is 0% gray in a color. Nature does not come in 100% saturation, but the higher the saturation the more expensive the gem. Hue is color perceived to be red, purple, yellow, green etc., meaning white, black and gray have no hue. Some hues, like red, pink and blue, are (today) considered being more valuable than others (e.g. yellow or purple). This has and continues to change with fashion, over time and between cultures. A color mixed with white is a tint. A tint is lighter and less saturated than a color without the addition of the white. Generally speaking: the less tint, the better the hue, the higher the price. Exceptions are e.g. the padparadscha, the rhodolite or cornflower blue sapphire which are characterized by the combination of hue and tint. How to describe a color? You may describe a stone correctly as "blue (hue) mixed with 20% gray (saturation) plus a bit of yellow mixed with a lot of white (tint)". Such descriptions are hard to imagine and not very attractive. Therefore color professionals use more illustrative names such as "ivy green", "cornflower blue" or "salmon orange" in connection with attributes like "strong" or "vivid". Because these color names refer to something common and natural they express color in a more accessible way. What is a color grade? 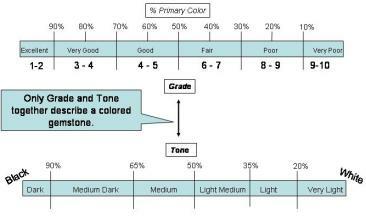 Color grade describes the strength of the main color compared to other colors visible in the stone. A 100% color grade in blue for example would imply that there are no other colors (like purple or violet) visible in the stone. If there was also no gray in the stone, we would have a 100% saturation with a 100% color grade, but such a stone has never been found. Some varieties (e.g. the Padaparadscha), which are defined by a combination of main colors (e.g. pink and orange), will receive a high color grade from the purity of the combined main colors, meaning the absence of other colors e.g. brown. What is a color tone? Any color grade has to be seen in combination with tone. Color tone varies from "very light" to "very dark". It is the amount of black or white mixed into a color. In the extremes a colored stone could be white (light 5) or black (dark 95) with just a hint of color. A stone might, for example, show a rather pure blue, free of green or violet, but it might be of a very light tone thus the blue is less strong. Or it might, in the opposite, be of such a dark tone, that it appears rather black than blue. Gemstones with high color grades and light-medium to medium-dark tones fetch the highest prices. "Visible" color zoning but "Free of Inclusions"
3. Gradual: The color weakens in some parts but not abruptly. 4. Visible: Stone has clear color patches or layers. Other than clarity, which is judged with a 10x lens, color-zoning is described only as far as it is visible to the unaided eye. The clarity of a stone is commonly described as being from "Free of Inclusions" over "Lightly", "Moderately", "Heavily" to "Excessively Included". - Very Lightly Included: Only a pro with a lens might find an inclusion, but maybe not. - Excessively Included: A stone might not be durable. Photo: Two "Heavily Included" sapphires with "Visible" color zoning. Remark on photo: While the yellow is too unevenly included, the blue has some "character", strong color but little luster, and it is not unattractive, though its value will be somewhere around only 5-10% of a similarly colored stone which is "Free of Inclusions". The estimated maximum of light which a stone reflects in one position under normal light conditions. High brilliancy is, amongst others, the result of skilled cutting. It is the height of a stone divided by its minimum width. The "ideal" range lies between 60% and 80%. It is mainly determined by the given shape of the rough stone. Under 50% a stone might be called shallow. A shallow stone with a light tone will find it difficult to maintain saturation. A stone with 90% depth and a dark tone on the other hand might blackout. Brilliancy and depth are joined in the "Cutting Grade" which also includes the general quality and precision of the lapidary's work and the finish of the stone. Here we will also mention any flaws or other weaknesses regarding the cut. Excellent: Far above average and flawless. This quality is rarely seen in jewelry and is mostly acquired by collectors or long term investors. Very Good: Above average in all criteria with one or two minor flaws. 900 of 1000 stones coming out of an average Sri Lankan mine will fall into the category "poor" and "fair", while only one(!) might receive an "excellent". BUT: Whatever gemologists, traders, miners, jewelers or grading reports say, you are the only one authorized to judge beauty. The less you like what everybody else does, the better for your budget. Here are our prices ($/carat) for manually mined, individually cut, certified and untreated Ceylon gemstones based on the overall grade. Read here to judge sizes for jewelry. Today there are more good gem photos than good gems in the market. We do not color enhance or brighten or darken our photos. Our photos are made with a "normal" Nikon 5400 and every stone is shot individually. We never re-use old photos. Left untouched, photos might show inclusions to dominate, weaken or strengthen a color, make a light stone darker or vice versa. If that is so, we mention it in our comment at the end of the grading report. If you think a photo differs from our grading, you can assume that the grading is closer to reality than the photo. In any case our stones convince best in person. Our hand-shots: Please take note that our hand photos are made with fingers of US-ring-size TWELVE (no hand-model within our budget). Thus, if you have a ring-size of, say, SIX the gem will look twice as large on your fingers. Most aspiring gem-lovers are overwhelmed by the depth and width of the market. If they have been confused in a B&M jeweler, a quick web-search is going to do the rest. But, alas, there is no competence for the lazy. Selecting antiques, real estate or vintage cars requires homework too. 101 buying guides offer good reading and places like this help. Be prepared to spend weeks in a fog but do not despair. Collecting gems is a passion and the learning never ends. Here is a fresh perspective for the determined beginner. It comes out of a thousand discussions with early stage buyers and their consecutive decisions. First allow this axiom: "No natural gem is perfect." The deeper your knowledge the better your choices will get, but there is no final word. All veterans know this. Consider that 95% of what comes out of a mine goes straight back into the pit. Most rough material is too small, too included, too dull or too unshapely to be cut into gemstones. Only the remaining 5% make it into sales and they all are flawed. It is those flaws that need attention: Evaluating gemstones means recognizing imperfection. 1) A terrible gem could here, theoretically, make it to minus 30. Yuk! This individual list has no fixed reference. You can add or disregard issues or give reverse ratings. It needs to look different for cat's eyes, pairs or color changers; in fact, the list will look different for every single purchase. Professionals make this kind of evaluation automatically and in seconds. You need not to be that fast. Also, you need not think of anything other than what you want or like; and that is entirely up to you. You may find a specific color perfect and some treatment acceptable while other buyers might not be interested in the same stone for half the price. As always, if you want what everybody wants you need to dig deeper. Imagine the one elusive but perfect stone: It would have no window (not even a tilt window), be free of inclusions but not synthetic, have no color-zoning, sport an art-full precision-cut, be untreated and have exactly the hue you want it in and in exactly the right tone. Plus, it needs be in the desired size and shape, have ideal proportions, be of your preferred origin and have a perfect certificate. And it must be for sale at an affordable rate. Back to reality: On the one side we have a set of negotiable flaws. On the other side we have restrictions in budget and time. A successful purchase needs to balance these two sides (only eternity or unlimited budgets are excused). Practically, you might be shopping for a round yellow sapphire in 2 carats and you need to order soon. The web shows legitimate offers between 250 and 2000. Study the flaws that make the difference between 250 and 2000. A terrible window may bring you from 2000 to 1000, a pale hue downs it to 500 and heat may bring you to 250. Below 250 (e.g. bad window, pale, BE-treated and included) the definition of gem-quality sapphire gets shaky. If you like numbers you may actually chart your alternatives with prices and flaws on a rough scale. In the end, I advice to follow your heart, not the numbers. Remember: "There is always a better one".